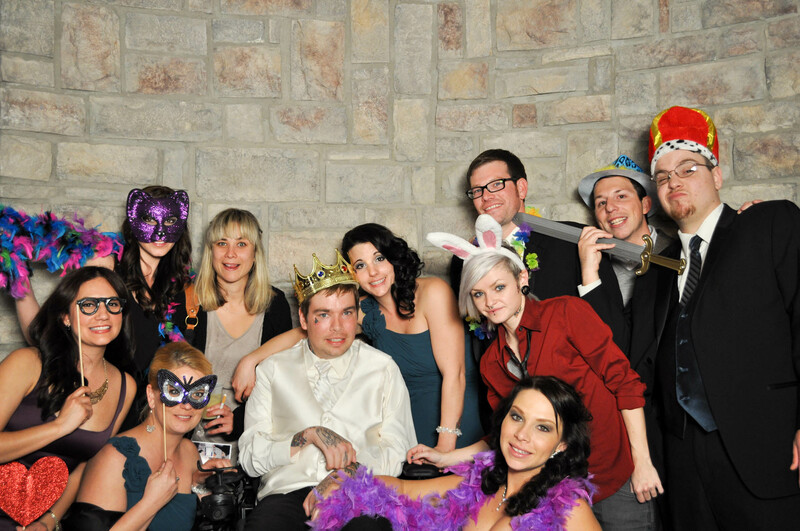 Stephani and Nick’s wedding and reception were held at The Castle at Ashley Manor. Stephani’s wedding planner, Bonnie, contacted Digital Expressions Photo Stations because the photo booth company they had hired had backed out at the last minute and Bonnie was in a crunch. Our normal price for two hours is $400 but because of the predicament the other photo booth company placed the wedding planner and because of the circumstances, we agreed to do the wedding reception for $200. Nick, the groom, has Lou Gehrig’s disease and Nick wanted to be able to say, “I do.” There was no doubt that we had to help this wonderful couple out. I had been wanting to have out photo booth inside of one of the turrets at The Castle and this was our opportunity. It fit perfectly and the wall as the backdrop was perfect. Nick was in a wheelchair so our photo booth was perfect because it allowed him to get in and out of the pictures with ease and without help.